2019 Labor Law Posters only $17.95. Your company will be in complete compliance with the US Department of Labor, OSHA and your State DOL. For a Very Low Cost, We guarantee your business to be fully compliant for your required Federal and State Labor Law Posters. 24 States have Updated their State Labor Law Posters in 2019.
mandatory Labor Law Postings. State employment laws change yearly. 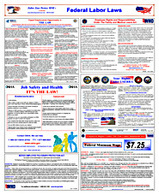 Our required Labor Law Postings / Notices are always the "Most Current and Up To Date" At Your Time Of Purchase. Our ​Website and Posters are updated (same day) when a law change is released. 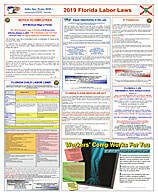 ► All of our Posters are "Updated and Ready to Ship The Same Day" as the New Laws are Released !!! Our Website is Updated Daily - You can easily visit your State's Page to view any new / recent updates. *** Just add our website to your favorites or on your desktop.